We've listed some of the features found in numberED that add to its robust numbering capabilities. A short description of each of them is explained below. numberED asks you to define the layout of your forms on a sheet as part of setting up your print job. If you are using a commercial sheet in that job, numberED may already have that sheet pre-defined for you. numberED provides definition for over 900 commercial sheets from vendors Avery, AOne, APLI, Devauzet, Formtec, Herma, and Hisago. Just select the pre-defined sheet from the list of Vendors and their associated sheets. 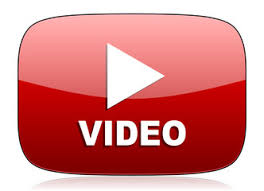 Many times a commercial sheet either cannot be found to match your job or is more costly than a custom sheet may be. numberED provides you the ability to create your own sheet definitions. You are asked to name your custom sheet and provide dimensions that indicate the size of forms on that sheet and where they are placed. The diagram to the left shows the information required. The height and width dimensions indicate the finished (after cutting) size of a sheet's form (ex. ticket, label, card, ...). The vertical and horizontal gutters show how much waste space (if any) exists between neighboring forms on the sheet. The number down and number across indicate the number of forms on the sheet vertically and horizontally. The side and top margins indicate how much waste on the sheet must be removed from its edge to the upper left form on the sheet during finishing. Every numberED job begins with selection of a sheet to be used in the job. Frequently the sheets contain multiple forms. When the sheet is selected, numberED displays a single empty form from the sheet. You place into that form the information you want printed by numberED into all the forms on each sheet. You drop number, text or image blocks onto the form and drag them to their desired locations. numberED lets you layer these blocks when needed. You can rotate these blocks and mirror images. Form layout involves selecting combinations of number, text, and image blocks (as needed), dropping them onto a blank form and dragging them into place. Images can be resized by dragging the image edges. 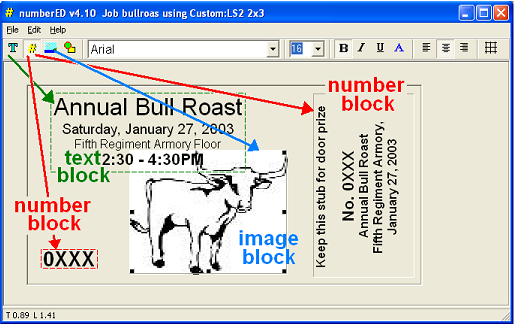 Number and text blocks can use any True-type fonts available on the host computer. 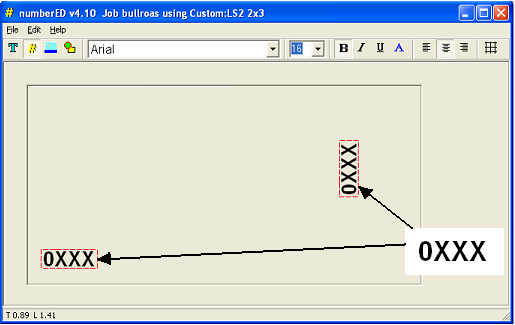 Font, fontsize and color can be set for individual characters. To achieve additional effects, number, text and image blocks can be layered (moved over each other) using 'Bring to Front' or 'Send to Back' actions. 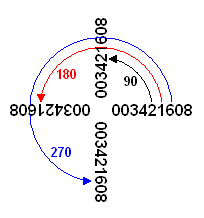 numberED provides you the ability to rotate (turn) number, text and image blocks 90, 180 or 270 degrees. Each block can be rotated separately. Mirroring in numberED is available for image blocks. The image is flipped horizontally (prior to any rotation). 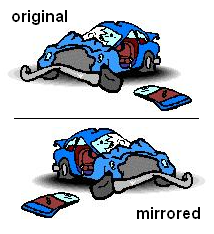 Using a mirror to view the flipped image will result in seeing the original unflipped image. Any rotation is applied after the image is flipped. Frequently jobs are the result of multiple production steps. numberED can be used as one of those steps to add only numbering to pre-printed sheets. You must define to numberED the layout of your sheet and where the forms are on it. Then numberED will display a single blank form into which you place a number block(s) - one for each time you want to print the form's number. You can use numberED to only print numbers, but it provides additional value to you by letting you add text and images to the form layout so that you can print numbers, text and images in one pass through the printer. 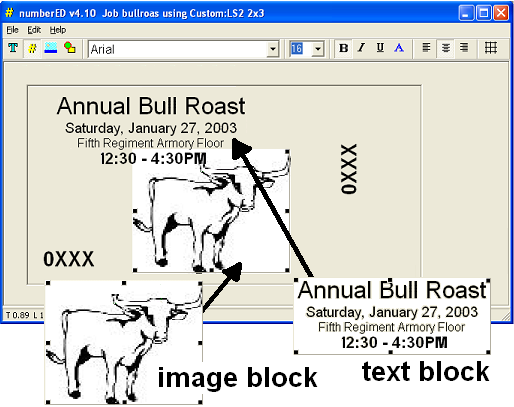 Text is composed in text blocks using actions similar to most word processing programs. Truetype fonts available on the host computer are used to develop the text. Images (eps, ps, pdf, png, jpg, jpeg, bmp, ico, wmf, emf) can be added to the composed form using image blocks. Text and image blocks can be rotated. Image blocks can be stretched or shrunk and mirrored, as well. In numberED backgrounds are used to cover the sheet before the composed content of sheet forms are printed over the sheet. numberED prints the background along with the superimposed sheet form layout in one pass to a printer. Backgrounds can be individual image files (eps, ps, pdf, png, jpg, jpeg, bmp, ico, wmf, emf, pdf) or page(s) drawn from Windows spool files (spl). Most all Windows programs output through the Windows print spooler. Using a numberED print driver, you can create a Windows spool file from your favorite Windows application to be used a background in a numberED job. You can tell numberED to operate in the Metric system (centimeters) or in the English system (inches) - the default. While in the chosen system, numberED will accept and display measurements in that system.